My favourite biographies to read are those of people I know next to nothing about. I can crack open the book without any of the trepidation I feel when I read about my idols – there is nothing more disappointing than discovering that someone you deeply admire is actually a self-pitying bore, unrepentant adulterer, vegan, or in possession of other similarly off-putting character traits. No, much better to stride out into the unknown. And that is just what I did when I picked up My History by Antonia Fraser. Despite being a devoted student of history, I’ve never actually read any of Antonia Fraser’s books. I think I had a copy of Mary Queen of Scots lying around the house for a few years but, in general, my areas of interest don’t overlap much with Fraser’s, at least when it comes to historical research. When it comes to the details of her life, however, I am absolutely fascinated. Going into this book I knew two things about Fraser: that she was an author and that her first marriage had broken up when she’d fallen in love with Harold Pinter. Her memoir of her relationship with Pinter, Must You Go?, has been on my to-be-read list since it was released several years ago. One day I’ll get around to reading it but I think this memoir of her youth and early adulthood was a much better introduction to Fraser, for me at least. I was even delighted to sit on the platform at the end of the row because in the romantic haze in which I chose to live, the Marquis of Vidal, saturnine hero of Georgette Heyer’s great novel Devil’s Cub, might see me sitting there and…after that I was vague, and even vaguer about the circumstances in which the Marquis of Vidal or his like would attend a Labour Party meeting in Oxford in February. Aged eleven, I had discovered Trollope in a huge green-and-gold edition in my parents’ house. (I learnt later that there was a lot of wartime Trollope reading among the grown-ups ‘to get away from the war’.) Thus I was temporarily obsessed by the character of Lady Glencora Palliser in Can You Forgive Her? The tiny, tousle-haired heiress and her fatal love for the wastrel Burgo Fitzgerald occupied most of my waking thoughts. Anyone who loves both Heyer and Trollope is clearly a kindred soul. 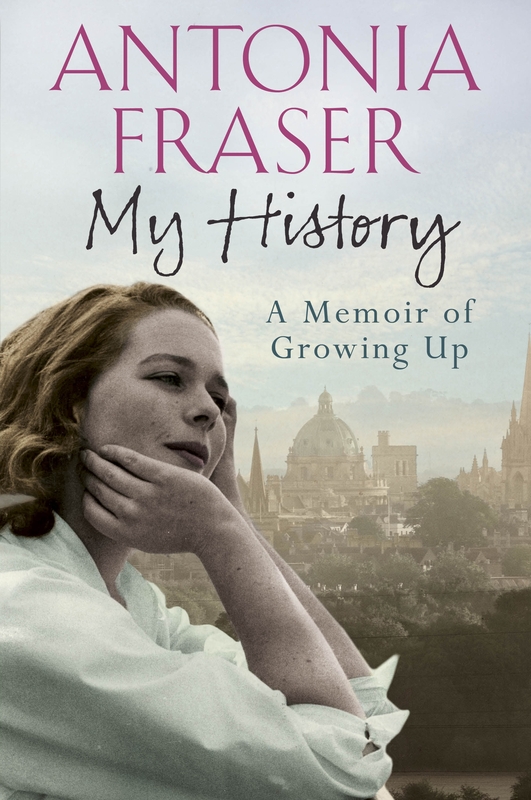 As we hear – in a charmingly self-deprecating style – about Fraser’s pleasant wartime childhood, excellence at school, and (rather too briefly described) adventures as a young working woman, we are also introduced into her alarmingly well-connected world. She vacationed in Italy with the Italian Prime Minister’s family, met Bernard Berenson in Florence (BB has shown up in my reading a least once a month this year), had her wedding portrait taken by Cecil Beaton (his gift to the bride), worked for the publisher George Weidenfeld, and was the niece of Christine Longford (whose novel Making Conversation is available from Persephone). There are countless other connections that I’ve forgotten but it’s an excellent resource if you’re ever stockpiling information to play six degrees of separation. Which I always am, obviously. Starting as a complete stranger to Fraser, this was a wonderfully entertaining introduction to her and her fascinating family. Now I just can’t wait to read The Pebbled Shore, a memoir written by her mother, Elizabeth Longford. Very kindred! And she has a lot of interesting connections, doesn’t she? I had heard about this, but it won’t be here for a while yet; I’m looking forward to reading it a lot more now. I’m vegan. I had no idea it was in the same category as adulterer and self-pitying bore. That was quite a revelation. I read a lot of Fraser a couple of decades ago and would probably enjoy this autobiography a great deal. I would definitely think this one would appeal to any fan of Fraser’s histories. She does talk quite a bit about her early interest in history and what attracted her to the figures and eras she’s spent her writing career focusing on. I had to laugh at your characterization of off putting characteristics! Vegans are becoming quite reviled aren’t they? Antonia Frasers books are really good. I loved her biography of Marie Antoinette. And I seem to remember reading an essay she wrote (maybe an excerpt) for Vogue about the loss of Harold Pinter. I’d be interested in reading this for sure! And I agree that it’s definitely better to read about someone you know next to nothing about going in! Poor old vegans. No cheese and no love. Marie Antoinette is the most appealing of Fraser’s books for me, at this point. Maybe one day! I had the Mary Queen of Scots book unread on the shelves for years until I finally accepted I was never going to read it. Her biography of Charles II was recommended to me (by a Heyer reader) when I was looking for books about him (after reading Heyer’s Royal Escape). This however sounds much more interesting! I’ve just realized that I also had her mother’s biography of Queen Victoria on the TBR shelves. Now her mother’s biography of Queen Victoria sounds like just the sort of thing to interest me! I do think you’d been fascinated by these – even if you don’t (like me) have any interest in Fraser’s histories.